Situated in one of Asia’s densely populated islands, The Bungalow in Vypeen is where you need to head to enjoy an island getaway and a slice of heritage Kerala. Ask your Malayali friends about Vypeen and they will tell you that this famous island town is known for its Portuguese heritage that blends beautifully with the state’s own heritage. And that’s exactly what you will experience during your stay at The Bungalow. Built in 1930, this heritage property is a mixture of Portuguese, Dutch, and Kerala architectural styles. 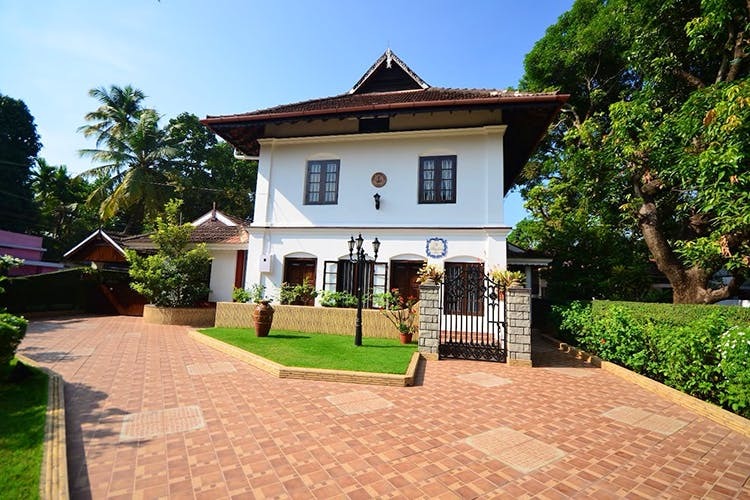 Staying at this property means you are away from the hustle and bustle of the Kochi town and an opportunity to enjoy the Portuguese influences that are still visible in either the dialects of a few Anglo-Indians or around the heritage sites such as the Church Of Our Lady Of Hope and Pallipuram Fort. More than half a century old, you will see that the Portuguese-Dutch influences are still preserved at this three-storied bungalow. The rooms, Sao Gabriel and Santa Maria, named after Vasco Da Gama’s and Christopher Columbus’s flagships respectively, have colonial vibes written all over it starting with the rosewood flooring and ceiling. The Sao Gabriel, an ensuite double bedroom space is the biggest of the two with Santa Maria having four-poster twin beds and a bathroom adjacent to the room. The rooms open out to a small space that’s tastefully done with colonial-era antiquities and furniture. Up the wooden staircase leads you to the attic that’s designed as a common space with easy chairs and the likes. Even if your stay is for a day, a visit to Fort Kochi is a must. But the reason why we are telling you to visit Fort Kochi is not only because every nook of this region is steeped in history but also because your ferry ride from Vypeen to Fort Kochi is picturesque as the Chinese fishing nets silhouetted against the setting sun. #PostcardsFromKerala can be a hashtag you can use when you are Instagramming your ferry crossing. The prices are on request but when we nosed around Airbnb and other booking websites such as Hostelworld and Booking.com, we found the rooms are priced roughly between INR 4,000 and INR 6,000 for two per night.